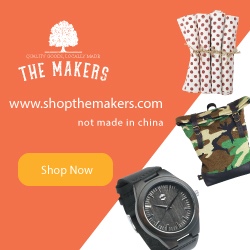 Doorposts is a company with which I am quite familiar. Does the If-Then Chart ring a bell for anyone? I proudly displayed that handy dandy discipline chart in my home when my kids were little. Since my kids are no longer little anymore, I was delighted to see that Doorposts was offering Schoolhouse Review Crew members the opportunity to review something for older kids - either Because You Are Strong: A Study of Godly Strength for Young Men or Beauty in the Heart: A Study of Godly Beauty for Young Women. 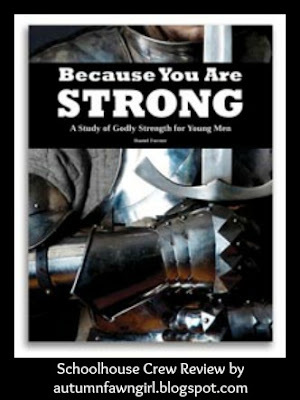 Our family received Because You Are Strong: A Study of Godly Strength for Young Men by Daniel Forster. If you have young men in your household who are full of strength and energy, stay tuned to see how those traits can be applied and guided according to God's design. 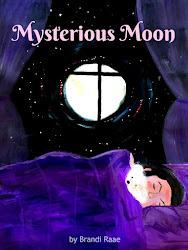 Don't you love the cover of this book? I do! It conjures up feelings of courage, chivalry, and honor, and I can't help but picture a damsel in distress being rescued by a handsome knight in shining armor. (I know, so cliché, right?) Well, the outside of this book does pose a striking image, but it's what's on the inside that counts the most! Primarily written for young men (ages 10-12 and up), this study focuses on gaining a biblical understanding of strength and learning to practice Bible study skills. Strength is a gift from God and should be used for His glory. By studying God's Word, experiencing various types of Bible study throughout the book, and practicing the methods learned, your young men can indeed stand strong. This study can also be completed by girls since much of what the Bible says about strength can be applied to men and women alike. There are a few places where alternate questions are provided for girls, though, and they are marked with an asterisk. The alternate questions can be found in the back of the book. My oldest son who turned 14 this month is using Because You Are Strong on his own. I think this is a great opportunity for him to really begin using the above methods to study God's Word more in-depth! In all, there are 74 days worth of study which will take about 15 weeks if you complete five assignments per week. Forty additional ideas for further study are given at the end of each study, so it could be stretched out to cover an entire year of study. So far, my son is staying on the one-assignment-per-day schedule. It is recommended that you have Nave's Topical Bible and Strong's Exhaustive Concordance to completely benefit from the study. We don't own either of these books, so my son is using the recommended online tools on his Kindle Fire. He says they work great. Also, he told me he loves the app, Bible Minded, that the study suggested he download. This app helps with memorizing Scripture. So how does one of these studies work? Well, let me show you . . . I am using Study 2 as an example here. Each study begins with the title, subtitle which tells which type of study it will be, and a Bible verse. Next, the topic of the study is introduced and briefly explained. After that, the study is divided into daily lessons, and your child can begin completing the assigned tasks. 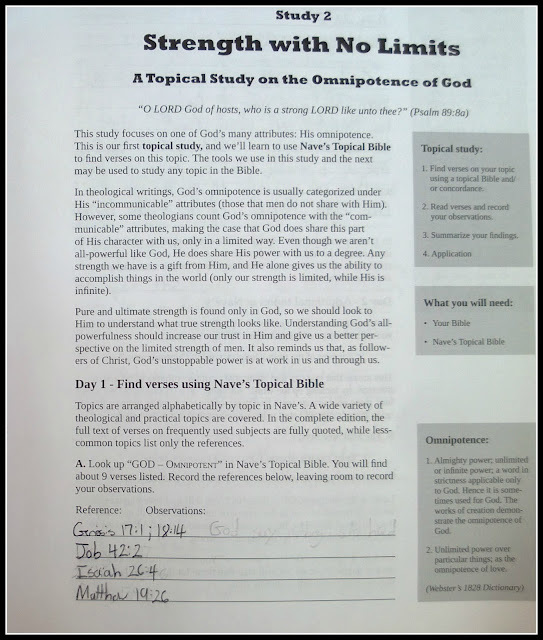 As you can see, for Day 1 of Study 2, my son began by looking up "God - Omnipotent" in the Nave's Topical Bible (online resource) and recording Scripture references. He didn't have enough room to write his observations on this page. 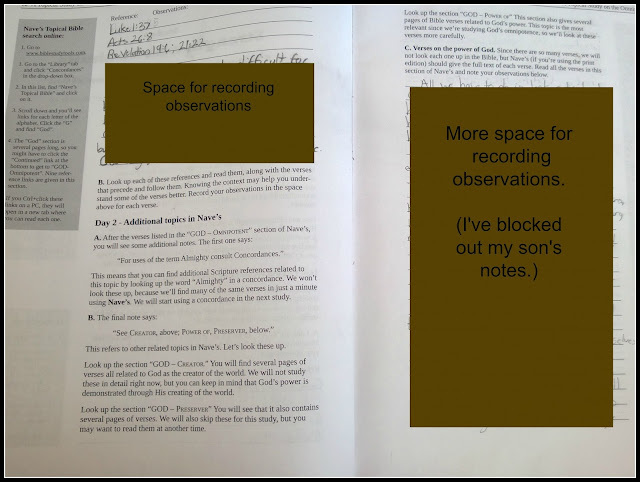 Also, notice the gray boxes that appear on the right and left hand sides of the pages in both of the examples I have provided. These boxes give important information such as what the study is about, supplies needed, definitions of key words, online resources, ideas for further research, and much more. These boxes can be found on most of the pages throughout the study. On Day 2, my son looked up additional topics in Nave's, read Bible verses, and recorded his observations. Though not pictured, on Day 3 he organized his observations under provided topics, and on Day 4 he answered questions about how he could apply what he learned. The individual studies don't follow the exact same format, but hopefully you have a general idea of how the book works. "Because You Are Strong is a great Bible study for young teens. This book introduces many different methods of Bible study such as topical, meditation, character, and many more. Also, challenging questions are provided at the end of the assigned reading to make sure you are understanding everything you are studying. I think this study is really going to help me increase my knowledge of the Bible and grow closer to God. I believe this unique type of Bible study is fun, engaging, and inspiring for Christian teens." 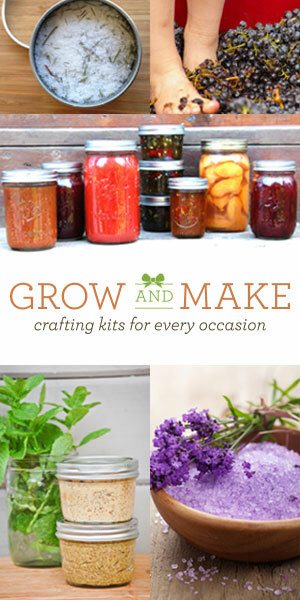 This study is available as a softcover for $14.00, or as an eBook (PDF) for $10.00. The page count for both books is 104. Great review, Autumnfawn. We reviewed the Beauty in the Heart study.